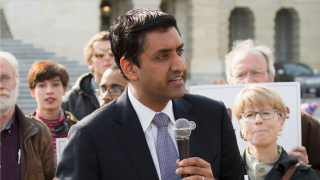 File image of Rep. Ro Khanna. Congressman Ro Khanna, California's 17th district representative, applauds Silicon Valley for their contributions to the tech space, but he believes they can serve more people, specifically those outside of Silicon Valley. Khanna, who represents South Bay cities such as Sunnyvale, San Jose and Fremont, implored leaders of the tech industry to "answer the call to service" and do a better job at creating a day in which Americans everywhere benefit from the wealth overflowing from the prosperous tech companies in the Bay Area, according to the congressman's interview with Recode. "Our country’s going through a profound transition from an industrial age to a digital age," Khanna told Recode. "The gains of that transition have gone to a few — people who are creative, brilliant, at the right place at the right time. But there are a lot of folks who have been left out in that transition." Khanna went on to say that he dreams of a time when all Americans believe they "can be part of a technology future" that can "work for their families in an empowering way." That can happen if Silicon Valley leaders share their wealth with the world, Khanna told Record. Khanna also demanded that Silicon Valley companies not forget to take care of their own employees. He specifically addressed Uber and called for the ride-hailing giant to treat its workers as true employees, not just independent contractors.